Cast Iron Stoves are by far the most popular form of wood burning stoves in the UK, partly because of their versatility and partly because of their traditional styling. Traditional cast iron stoves can easily be used to replace an open fire and are designed to fit into fireplaces and be neatly installed into exisitng chimney stacks. Cast iron wood burning stoves do vary greatly, however, in both looks, heat output, physical size and quality. You should take care to match your requirments to the cast iron stove that you choose and not just purely go for looks and price. First and most importantly, what heat output do you need from a traditional wood burning stove? 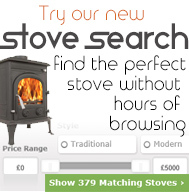 You can use our guide to what size stove buy, by using out heat output calculator. Simply type in the dimensions of your room and it will give you a guide to the heat output your require from your stove. The physical size of your cast iron stove is also a real consideration as it must fit into your fireplace with enough room to comply with the building regulations minimum clearance distances. There must be a mininmum clearance all around the stove, combustable materials must be kept even further away and the stove must be placed enough hearth in front of it to pass the building regulations. Lastly, look for quality as well as price. Our budget range of stoves are all great value for money and great cast iron stoves but higher quality branded stoves offer higher efficiency ratings, meaning that your cast iron stove will cost you less to run and harm the environment less. High quality stoves are also more controlable allowing for better temperature control. At the end of the day the cast iron stove that you choose needs to look great and fit into your home, whether you want a tradtional stove or a more modern look our range of stoves should have something for you.